Easy homemade chocolate recipe using milk powder and cocoa powder with step by step photos and video ! Wish you all a very happy Valentine’s day !!. 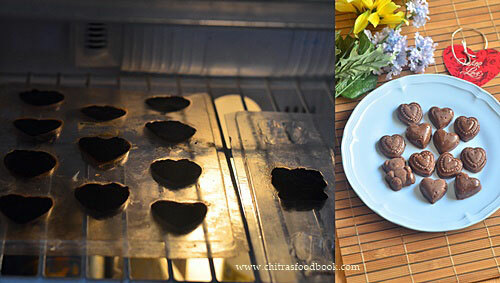 When I was looking for some interesting Valentine’s day special recipe, homemade chocolates came to my mind. Long back I have shared a Vegan version of chocolate recipe using cocoa powder,honey and coconut oil. Though it is an easy, perfect and fool proof recipe for homemade chocolate ,the flavor of coconut oil would be dominant which many people don’t like it. Many of my readers who had tried that recipe requested me to share an alternative for coconut oil. I tried it with butter and even with dalda but it didn't work.So I was looking for a chocolate recipe that uses butter and cocoa powder. I came across this homemade chocolate recipe without oven in YouTube video . I just halved the quantity of ingredients and tried it today. It came out really well but not tasting like silky smooth Dairy milk. It was pretty good in taste like Five star chocolate with a mildly chewy, fudgy kind. But its quiet addictive to eat :) To make Dairy milk kind of chocolate, we must use cocoa butter to achieve the silky texture. In India, cocoa butter is not easily available and its very costly to buy online too. 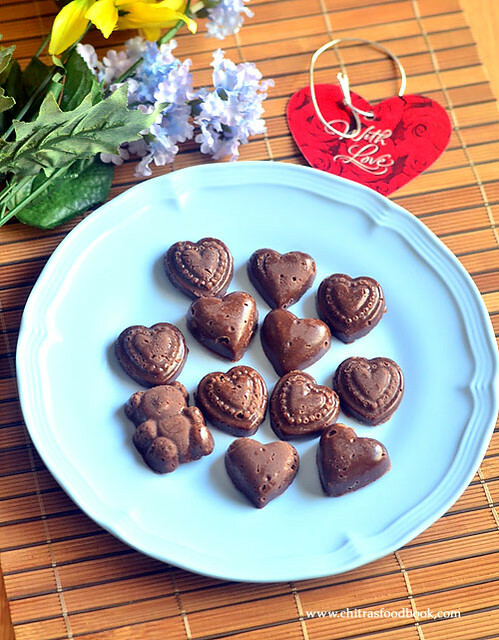 Another easiest option is to melt dark compound or white compound chocolate either in microwave oven or stove top ( Double boiling method) and make chocolates. It tastes really good equal to the store bought ones. Soon I will make a detailed post on that. 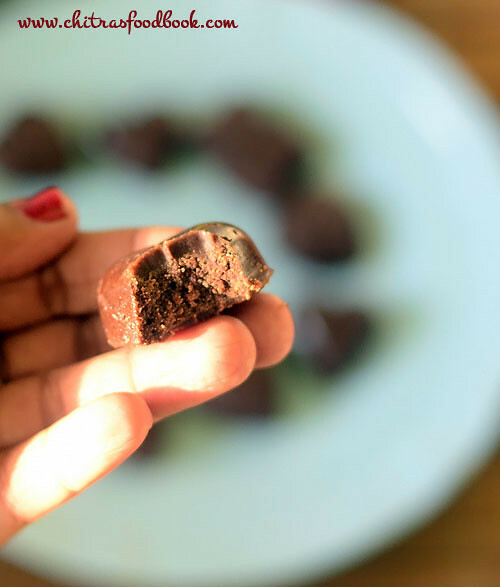 But this chocolate recipe is made with 4 simple ingredients like milk powder, sugar, cocoa powder, vanilla essence and Butter ( clarified ghee). Cooking procedure is also easy. You don’t need to check for one string consistency sugar syrup. Its just mixing and freezing. Homemade Chocolates would be ready ! 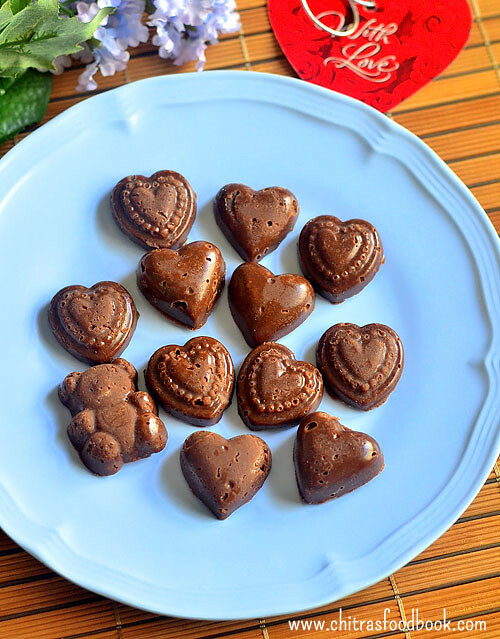 Now anyone can make chocolates at home using this recipe. This chocolate tastes the best when served chilled. But it stays good for an hour without refrigeration. So you can make this ahead and serve kids for birthday parties. Kids would love this chocolate for sure. 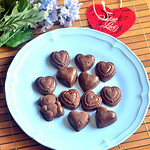 Do try this easy homemade chocolate recipe for this Valentine’s day and have a great celebration. Surprise your Husband and Kids with this lovely chocolates this evening. Soon I must try Raksha’s favorite Milk chocolate/ white chocolate as well by replacing cocoa powder with milk powder. Now lets see how to make chocolate at home using cocoa powder and milk powder with step by step photos and a video for better understanding ! Hope you will try and like it. Easy homemade chocolate recipe - How to make chocolate at home with cocoa powder with step by step photos and video ! In a bowl, mix milk powder and cocoa powder. Set aside. Boil 5 cups of water in a wide bowl or kadai. Allow it to roll boil well. Switch off the flame. Take a bowl that fits in the kadai. Add 3 tbsp soft butter to it. Keep the bowl inside the hot water kadai. Mix the butter and melt it completely. Keep the bowl inside the hot water throughout the procedure. Add icing sugar or powdered sugar to the melted butter.Mix well. It will resemble a creamy paste. Add milk powder + cocoa powder mixture to this and mix well. It will become a thick paste by absorbing all the butter. Lastly add vanilla essence, mix well. (IF YOU FEEL THE MIXTURE IS TOO THICK, ADD 1 TO 2 TBSP MILK TO LOOSEN IT). Take a chocolate mould ( Either plastic or silicone mould) and fill the chocolate mix. Pat it well to level the chocolate. Excess butter may ooze out. Don’t worry. Just fill the mould and freeze it for one hour. Remove the mould and rest it for 5 minutes. Remove the chocolate and enjoy !! 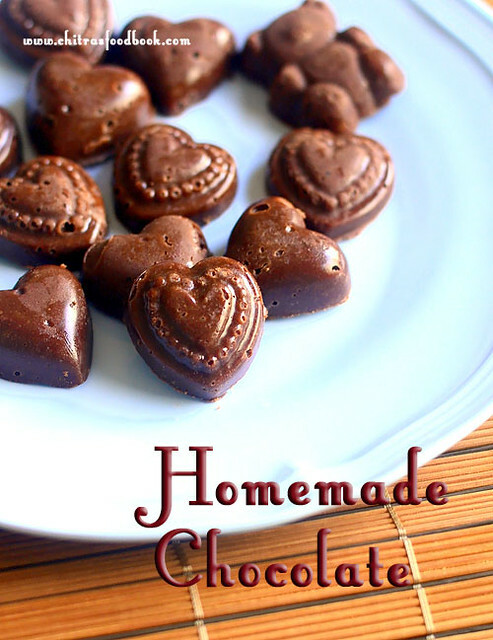 Enjoy this Valentine’s day with this simple homemade chocolate recipe ! Butter should be soft at room temperature. So keep it outside for few hours if its hard or soften the butter in microwave for a minute. For variations, you can add finely chopped nuts or raisins to the chocolate batter. Water should be very hot so that butter can melt easily. Remember to keep the bowl inside the hot water throughout the cooking procedure. It helps the chocolate to set well. For making milk chocolate/white chocolate, just replace cocoa powder with milk powder. I used light cocoa powder. If you use dark colored cocoa powder, chocolate tastes like dark chocolate with mild bitterness. You can try to add equal amount of milk powder and cocoa powder i.e 2 tbsp each for more chocolaty taste. Try this easy, simple chocolate at home and enjoy the occasion !! Hi Chitra its delicious and easy too. I LL definitely try. Hi,Yes what you did is right. It will become a thick paste only. It doesnot become smooth as you think. In the stepwise picture, you can see that. As you have added milk, chocolate doesnot freeze. So add little more cocoa powder,milk powder and make a thick paste. Then freeze it. It will set I guess. Hope it works. Thanks.